De-Mer-Tox™ capsules contain several vitamins and other dietary constituents that support heavy metal detoxification and may protect against the toxic results of amalgam filling removal. “Silver” amalgam tooth fillings are known to continuously release highly neurotoxic mercury vapor into the mouth where it is then absorbed into the brain. This mercury release is greatly accentuated during the extensive grinding required for the replacement of old amalgam fillings. There is some evidence that adverse metabolic and behavioral effects may be associated with this mercury exposure from dental amalgam fillings. Although symptoms of chronic, low level mercury exposure may be relatively non-descript, severe signs of toxicity may appear later in life. Research has shown that chronic inhalation of low levels of mercury vapor can inhibit polymerization of the brain protein tubulin which is essential for the formation and maintenance of neuron microtubular structure. Mercury can also disassemble these neuronal microtubules. Mercury, a sulfhydryl-reactive metal, can affect a wide variety of metabolic processes. It is not only a prooxidant, but also inhibits antioxidant enzymes and depletes intracellular glutathione. L-glutathione (reduced), a naturally occurring tripeptide of L-cysteine, L-glutamate, and L-glycine, is the essential cosubstrate for two major antioxidant enzymes in the body, glutathione peroxidase and glutathione reductase. N-acetyl-L-cysteine is a precursor for the sulfur amino acid cysteine, used in the synthesis of glutathione. Dietary sulfur may play an important role in mercury detoxification as studies have shown an inverse relationship between non-protein sulfhydryl levels and mercury organ content. Thus, an increased body level of non-protein sulfhydryls may avoid mercury accumulation and its deleterious effects. 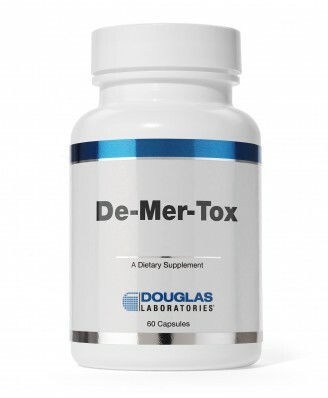 Consequently, it may be most beneficial to provide the improved nutritional detoxification support of De-MerTox™ capsules during the removal of amalgam fillings or for support of high mercury serum levels.